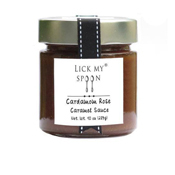 Kristine Insalaco-Gaioni of Sarasota, Florida , a former pharmaceutical rep and avid foodie, tasted a caramel sauce at a friend's baby shower and thought, "I can make a better one." And make one she did. Crafted in small batches, Kristine uses fresh heavy cream from Florida's Dakin Dairy Farm, a sustainable dairy and the only one in the state of Florida that produces and bottles its own milk. Organic Fleur de Sel from France, pure cane sugar, and organic Madagascar vanilla beans ensure a caramel sauce that not only tastes delicious, but is free of any preservatives or antibiotics. Winner of a 2015 Good Food Award in the Confections Category, enjoy this scrumptious sauce as a topping for ice cream, fresh fruit, and cheesecake. Stir into coffee and drizzle over oatmeal or baked brie. The endless possibilities will have you "licking your spoon".